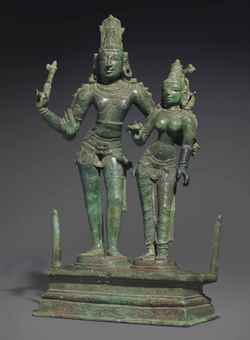 This twelfth-century (Chola period) bronze figure of Shiva and Parvati was “acquired in London in 2000” and can be traced back to a private collection in Italy that had “acquired [it] in Bombay in [the] 1960’s [sic]”. But how did this important sculpture, which was guarded by its priests and only removed from the inner sanctum of its temple once a year for a public procession, get from its temple in “South India” to Mumbai in western India and beyond? How was it removed from its sacred guard in India to the private collection in Italy? Its auction estimate is $250,000-$350,000. A bronze figure of Shiva and Parvati. The Lahiri Collection: Indian and Himalayan Art, Ancient and Modern, Lot 60, Sale 12255, Christie’s, New York, USA, 15th March 2016.